With studio apartment living spaces becoming smaller and harder to design, the most common challenge being faced now with these high-density urban zones, is how to create and distinguish your sleeping area. No one wants to wake facing their kitchen kettle, spending the day stumbling over the bedclothes or even worse, having guests perched on the edge of your bed trying to make small talk! Thankfully, none of this is necessary if we start looking at our small spaces and thinking of small solutions to fit. The very first idea to abandon though is the painful reality that existing bedroom furniture from a larger home will probably not fit well. Once this idea is let go, the adventure of creating a special sleeping zone begins. For tips and inspirations, check out these 6 different sleeping alcoves. This resplendent vision of white airy comfort belies all the claustrophobic visions of studio apartments that have many people begging for a larger space. The white fabrics on the bed blend seamlessly with the white curtains, white walls and even the pale wooden floor. This colour scheme is a common one used to expand the sense of spaciousness in a small room. But what's really special about this layout is the platform. The simple wooden steps and bare wooden finishes offer a very simple aesthetic and construction. This kind of platform is perfect when you want to avoid building a wall or blocking out the window light from the rest of the room. The wonderful thing is that a platform like this can be tiny enough to fit just the double mattress and nothing else. The important thing is that the platform creates a separate psychological barrier or zone for sleeping. 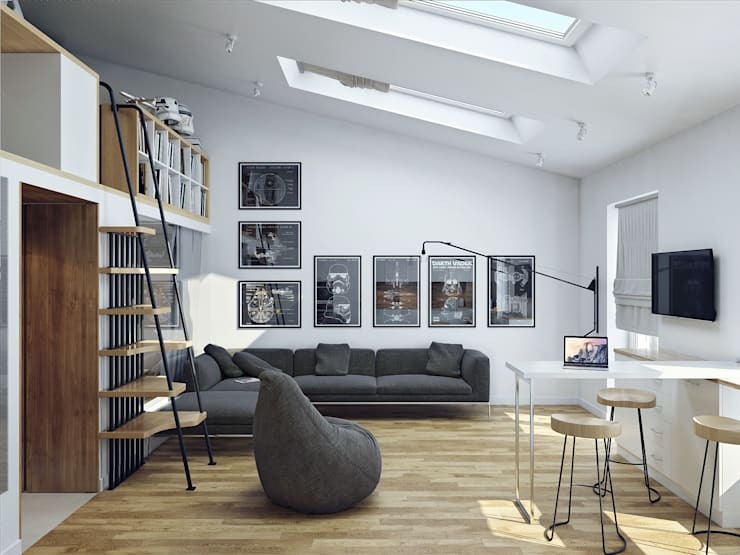 If you're lucky enough to have a bit of height in your room, a mezzanine or loft is the way to go. In this example, we can see how the elevated end of a sloping attic roof has been cleverly used to create the sleeping zone. Bookcases have been used to create privacy while allowing the light from the living area to spill over. Another great option might be some sliding Japanese white screens that offer privacy while allowing light to filter through. Similar to the bedroom platform, the bedroom island seen here is structurally separate from the walls and ceilings. It's ideal for a larger space where you may not want a more permanent attachment to the existing structure. While it's best not to elevate the island too high, the area underneath can be a great storage solution. This suspended bed is one of our favourite designs. The support structure attaching this bed to the ceiling creates a modern kind of four-poster bed. 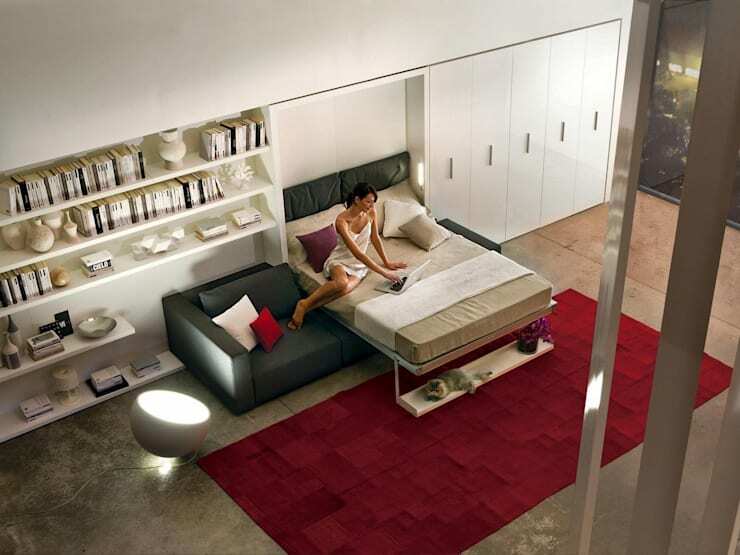 There is very minimal space between the bed and the built in bookcase, but it really isn't an issue. While the space is open to the rest of the room, the four posters and the suspended height of the bed create a psychological zone that separates the space from the rest of the room. The bedroom loft has its origin in the converted warehouses and industrial buildings of large cities where space is at a premium. 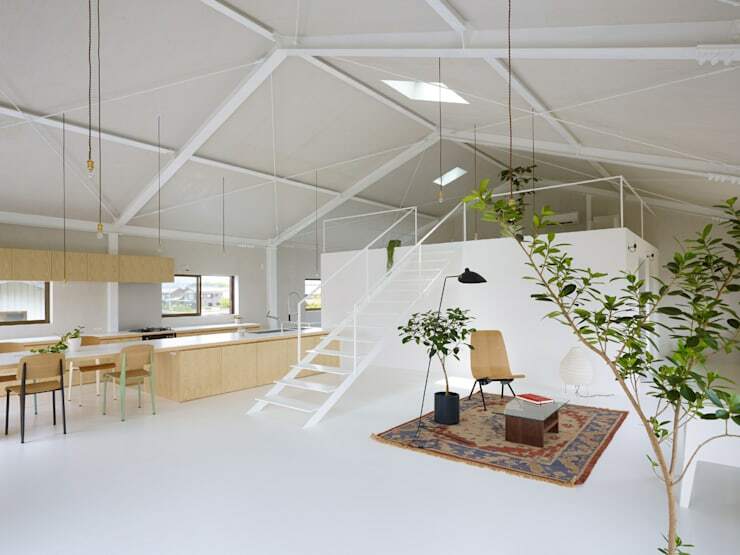 Before building a loft, a few things should be considered. There should be enough space to walk under the structure without bending your head. Ceiling light will be blocked by the structure so additional lighting will be necessary. A ladder may be a simple solution for getting up there, but if you are inclined to spend more, a spiral staircase as seen in this design by JC Decor is a very space efficient and stylish option. Last but not least, we have the humble fold out bed. A fold out sofa is really the most budget conscious option, but it can definitely get a little annoying to make up and fold out the bed each morning and night. For a little more money, a fold out bed that springs out from a wall fitting will offer a lot more flexibility and comfort. These days there are options as pictured here that fit seamlessly into a wall cabinet when not in use. 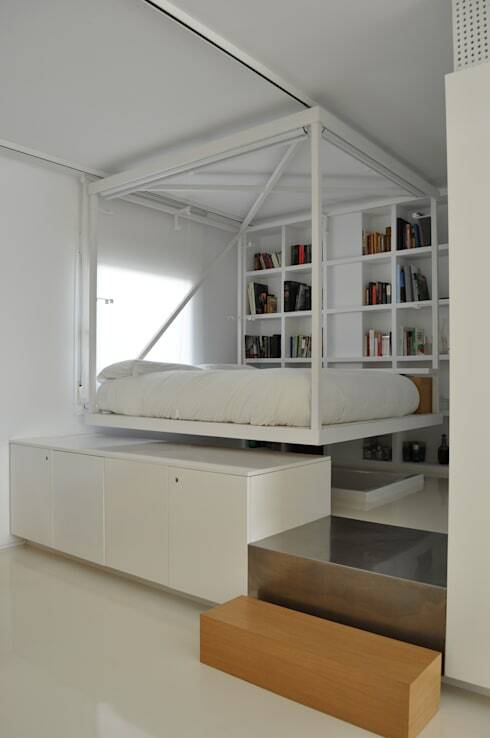 If you are interested in small bedroom solutions, you would love this Ideabook Marvellous mezzanines! What do you think of these tiny bedroom solutions? We'd love to hear in the comments below!